I received a phone call the other day from my parents as they were driving through Kansas on a road trip. They wanted to tell me about a curious roadside advertisement they had seen that they thought would interest me: the National Orphan Train Complex in Concordia, Kansas. I had never heard of this museum, let along its subject, so I decided to do some sleuthing. What I discovered was an intriguing, controversial, and apparently slightly obscure facet of American history. 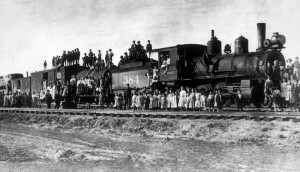 According to the museum’s website, the Orphan Train Movement transported around 250,000 needy, neglected, and orphaned children from New York to other regions of the United States and Canada from 1854 to 1929. Inspired by the roughly 30,000 orphaned children calling the streets of New York home, Charles Loring Brace founded the Children’s Aid Society, whose orphan train movement has been largely lauded as the beginning of the foster care system in America. A quick look in the 1900 U.S. Census at the New York Foundling Hospital, one of the institutions from which many of these children were taken, adds a stark reality to this trend of poverty and abandonment. The hospital, located in Brooklyn, spans 2½ pages of the census, and many of the children under its care cannot even list their parents’ place of birth. Advertisements were sent to cities along the trains’ routes and screening committees were established to place children with new families which were required to sign contracts promising fair treatment and education for the children. Trains then arrived with thirty or forty children accompanied by a few society representatives. At each stop, the children were lined up on stages and inspected, a process that betrayed what was often the primary motivation of adoptive families: labor. 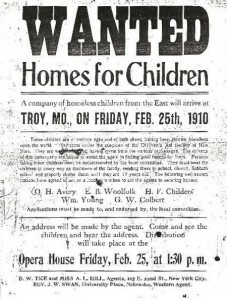 One of the most readily available examples of the orphan train advertisements is the one included here, alerting residents of Troy, Missouri, of the locomotive’s arrival on 25 February 1910 at 1:30 in the afternoon. While many of the children would have been dispersed from the immediate area after adoption, we can see that in the 1910 U.S. Census for Troy there were two adjacent families both counting a New York-born orphan among their household members. Philip Kuhne, a merchant, and his wife, Lenora, took in four-year-old John M. K. Monahan. They only had one child of their own, five-year-old Camille, and may have been anticipating a need for the help of a young boy at the family shop or simply felt compelled to adopt. The orphan train experience may have worked in John’s favor, as he seems to have been eventually integrated into the family, taking their last name, and naming his second son Philip. Seven-year-old Theodore Smith was taken in by farmer Will A. Howell, his wife Daisy, and Will’s mother Hetty. Unlike John Monahan, Theodore appeared not to have known much about his parents, as their places of birth were listed as “unknown.” Theodore also does not seem to have been as fortunate as John. He was not living with the Howells ten years later in 1920, but rather was found the next town over in Bedford, Missouri, with sixty-year-old Annie Heady. After that, he disappears from the record. The history of the Orphan Train Movement was conflicted, tied as it was to trends in child labor and the inherent tragedy of being orphaned in the first place. Some of these children undoubtedly found better lives and new families like John Monahan Kuhne. Others, like Theodore Smith, were less fortunate and likely suffered abuse, prejudice, and poor working conditions. Many genealogy enthusiasts are drawn to the pursuit through a desire to define themselves in relation to others that have come before, but that process becomes complicated when an individual is severed from his or her family history like these riders of the orphan trains. Still, many of these children grew to raise families and start lineages of their own. If you or anyone you know has come across an orphan train ancestor, there are ways to access to their records, although they are closely monitored due to the sensitivity of adoptions. Information about these records and other institutions associated with the movement can be found here. “History,” National Orphan Train Complex, http://orphantraindepot.org/history/. Foundling and Charity Hospital, Year: 1900; Census Place: Brooklyn Ward 29, Kings, New York; Roll: 1068; Page: 13A; Enumeration District:0548; FHL microfilm: 1241068. Ancestry.com. 1900 United States Federal Census [database on-line]. Provo, Utah: Ancestry.com Operations Inc., 2004. 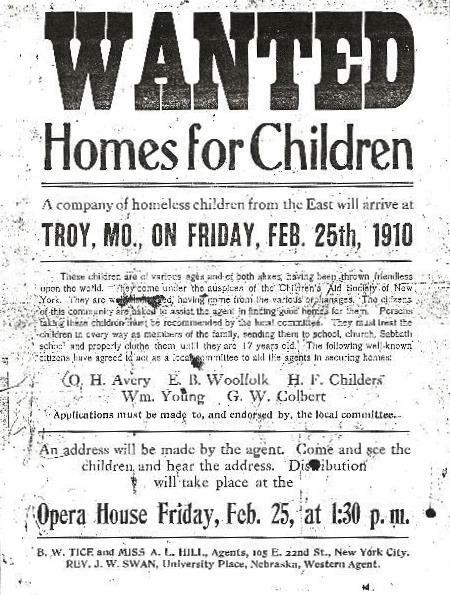 “The Children’s Aid Society,” National Orphan Train Complex, http://orphantraindepot.org/history/the-childrens-aid-society/. D. Bruce Ayler, “The Orphan Train Experience,” National Orphan Train Complex, http://orphantraindepot.org/history/the-orphan-train-experience/. Philip Kuhne, Year: 1910; Census Place: Troy Ward 2, Lincoln, Missouri; Roll: T624_794; Page: 5A; Enumeration District: 0082; FHL microfilm: 1374807. Ancestry.com. 1910 United States Federal Census [database on-line]. Provo: Ancestry.com Operations Inc., 2006. Philip Kuhne, Year: 1940; Census Place: Troy, Lincoln, Missouri; Roll: T627_2124; Page: 8B; Enumeration District: 57-1. Ancestry.com. 1940 United States Federal Census [database on-line]. Provo: Ancestry.com Operations, Inc., 2012. Will A. Howell, Year: 1910; Census Place: Troy Ward 2, Lincoln, Missouri; Roll: T624_794; Page: 5A; Enumeration District: 0082; FHL microfilm: 1374807. Ancestry.com. 1910 United States Federal Census [database on-line]. Provo: Ancestry.com Operations Inc., 2006. Annie Heady, Year: 1920; Census Place: Bedford, Lincoln, Missouri; Roll: T625_933; Page: 1B; Enumeration District: 95; Image: 29. Ancestry.com. 1920 United States Federal Census [database on-line]. Provo: Ancestry.com Operations Inc., 2010. I enjoyed reading your post. “Orphan Train” by Christina Baker Kline is an excellent book. It was my first insight to this facet of our American history. I met a lady whose husband’s father was part of this. He was adopted into a family in Kansas and came west with a historic local name. It was asking about the family tie that led to finding out about the orphan train connection. I, too, read Christina B. Kline’s excellent book as well as another one telling the story of these young orphans. There are two of these children in my family’s history which I tried to trace. I did connect by email with the wife of a grandson, but she had little information. It was of some help though. I had first learned of this project many years ago from a documentary on PBS– very enlightening. All I was told by my mother growing up about these children was that my grandparents “adopted” some orphans who came on a train in central Minnesota. Actually, they gave them to a son and his wife to work on their farm. Also, my high school across the street from my home, was the site for annual gatherings of orphan train children for many years. The Franciscan nuns sheltered many orphans and ran an orphanage in St. Cloud, Minnesota. I didn;t knw this at the time Iived in Little Falls, Minnesota. I am the head researcher at the National Orphan Train Complex. I spend every day trying to connect people with their lost ancestors. Every day we have guests in who had never heard of this erase in our history until they read the Kline book or saw our roadsign. It is such a rewarding experience to be able to give a person that link they so long for and to teach someone else about the Orphan Trains, so hopefully this erase will be remembered always. My great grandparents had a little boy from an orphan train. They lived near Kenyon, Minnesota. I often wonder if there is someone out there wondering what ever happened to him. I looked for his name on Ancestry.com, but didn’t find anything. I will find his name again and see if you can help me find a connection to someone. I have also read Christina B. Kline’s book. I, too, had been unaware of this project. Shortly after I read the book, the Ohio Genealogical Society had a article about 70 orphan train children who were destined for Preble County, Ohio, in 1866. The article’s author, Rebecca Hilbert, was able to find less than a third of them in the 1870 census. She assumed some of the younger children were adopted into their new families, but noted that even many of the teenage children were not in that census and wondered what happened to them. She then presented vignettes of some of the children she was able to find. [Ohio Genealogical Society Quarterly, Vol. 54, No., 4, 2014, pp. 373-377]. I read a book some years ago about the orphan trains, which painted a much more mixed picture. To start with, the Eastern orphanages were often dreadful places. And in many cases, the children living in them weren’t orphans at all. Their parents left them there out of sheer financial necessity, or when someone in the family became ill and the parents couldn’t care for one or more of the children, at least for a while. In some cases, the orphan trains were designed to solve a problem of a labor unbalance–too many children to serve as child labor in the East, and too few to serve that function in the West. If the children pulled out of orphanages had living parents who wanted to care for them but couldn’t, then what happened is truly a tragedy. And probably in cases like these, records on birth parents would be especially hard to find. That’s not to say that in some cases, the placements didn’t work out very well. But there were documented cases of abuse, as well. Theodore Smith that was taken in by the Howell family was not orphaned his mother, and 2 brothers, an infant and 12 year old passed away in 1907 he had 5 other brothers their father couldn’t afford to raise them all so he gave the 2 youngest boys up to the orphanage in canadaigua ny Floyd and Theodore were both taken to Missouri on the orphan train. Floyd came back to NY 62 years later and was reunited with his older brother Clair. Theodore and Floyd are my best friends great uncle’s. At the age 10, my grandfather and 3 of the 6 siblings, were orphan train riders. He and his one sister were adopted by the same family in western Iowa. The youngest, a 2 yr old boy was adopted in same county and another sister was raised in eastern Iowa. Their mother died 2 days after the birth to their baby sister. The oldest brother stayed with their father and the baby was given to their mother’s childless cousin. Their father nor any family members ever contacted the Aid Society to inquire about them. In 1950’s they found the baby sister and my grandfather and two sister rode a train from IA to NY to visit with her. My grandfather and his sister’s picture of when they were teens is on one of the window shades at the Orphan Train Museum in KS, along with their story. My mother’s cousin who is in his 90s and poor health has been writing a book of his mother’s life which will include her brothers and sisters. I was able to find information he didn’t know about the oldest brother who stayed with the father, most through newspaper articles found on fultohistory.com.